March Madness... That about sums it up. I have been working in education for many years now, almost 15. In this time I feel like my job has got bigger and bigger (class sizes, requirements, request). I know I'm putting some of this on myself. I want to do the assessments that are requested. I want to make amazing projects. I want to create choice in my room... I want, I want. But at what cost... and for what purpose. So like most of us, I am a great parents, a loving wife, a good teacher, a caring friend, a listener, leader, follower. I go to the gym and eat my salads. I have people who support me and love me. My husband is a rock star. I'm a lucky person. A very lucky person... so why can't I get my Sh@# together? Today I lost it. I had a break down in a staff meeting. See, I must not be the only one because our staff meetings are all about 'finding balance' and 'relieving stress'. My guess is a lot of us teachers are starting to loose it and my thoughtful, and intuitive principal is trying to do something about it. She is trying to give us the tools to manage because it is above her to lower our class sized and reduce the pressure of test scores. I mean that is so cool!! I had to do it. So I have been working on the sign and images the past couple of days and it's already March 5th and I don't have it up, and I have conferences coming up and I have the National Conference coming up and... Breath... and... (slowing down)... and I have March Madness all ready for next year when I will display this wonderful idea at the end of Feb. 2016. So yah, I freak out. I have meltdowns. There are lot's of things in everyone's lives that cause stress. I know and understand that. I have never shared my temper tantrums on my blog but I think it's important to understand life is lovely, and I have a wonderful life, and I appreciate everything I have and the people around me... but balance is something that we need to remind ourselves to do. I trip, I fall, I cry... and I get back up again. You are a rock star, hang in there it's almost spring break! I can totally relate to how you are feeling. Our end of course art exams k-5 start next week and I am so bummed out that we have to use valuable instructional time for students to take a meaningless test. First of all, the end of the course should be the end of the year! There are so many things i haven't gotten to cover yet. Second- our tests are just used to measure OUR effectiveness......which for me doesn't tell me squat because it is an invalid way of assessing. It is a multiple choice test- that is attempting to assess a performance based skill. Ridiculous. So I am using this week to review and then testing ......almost a month of wasted creative and truly artistic time for students.... Ugh. I run to relieve stress (when it is not too dark or cold) :) Good luck. Guess what? I am so, so. so very proud of you! You speak from the heart and we ALL need to remember to slow down, to take a breath and to get back up again. Thank you for your honesty and for your heart! So many teachers are at the breaking point, yet we seldom talk about it. Thank you so much for sharing. I don't have any great tips because I lost it twice this year in meetings. Most things we cannot say "no" to in our jobs- except the fun stuff, and you have to keep a little of that in for the teachers sake as well as the students sake. I am learning to take a "sick day" here and there when necessary. It does help. One of my favorite sayings is "every yes is a no." Everything you say yes to doing, you are saying no to something else. Finding balance is about finding the yes's that make you happiest. We ALL have those moments (days, weeks). You are awesome! Totally in the same boat!! 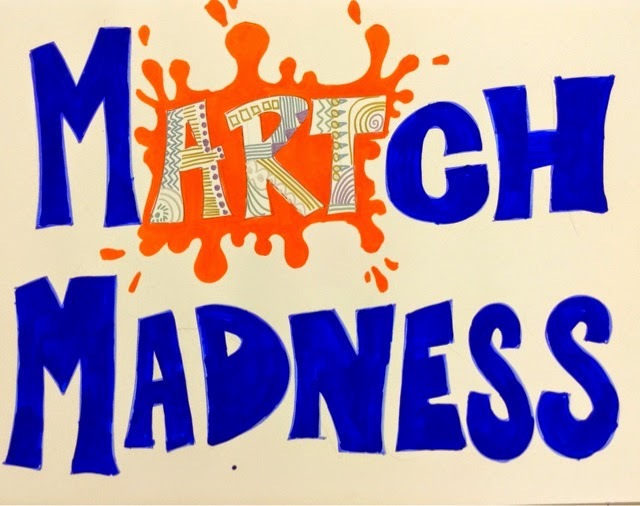 I saw the same March Madness and so wanted to do it but between state testing (I get pulled to give small group ACT every time!! ), exams, putting art in the display cases, going to testing inservice, and presenting at the Parent informational meeting on the new JumpStart program I had to skip the March Madness as well. Oh well, I can do a lot of things ok or I can do a few things well. Thanks for the post!! 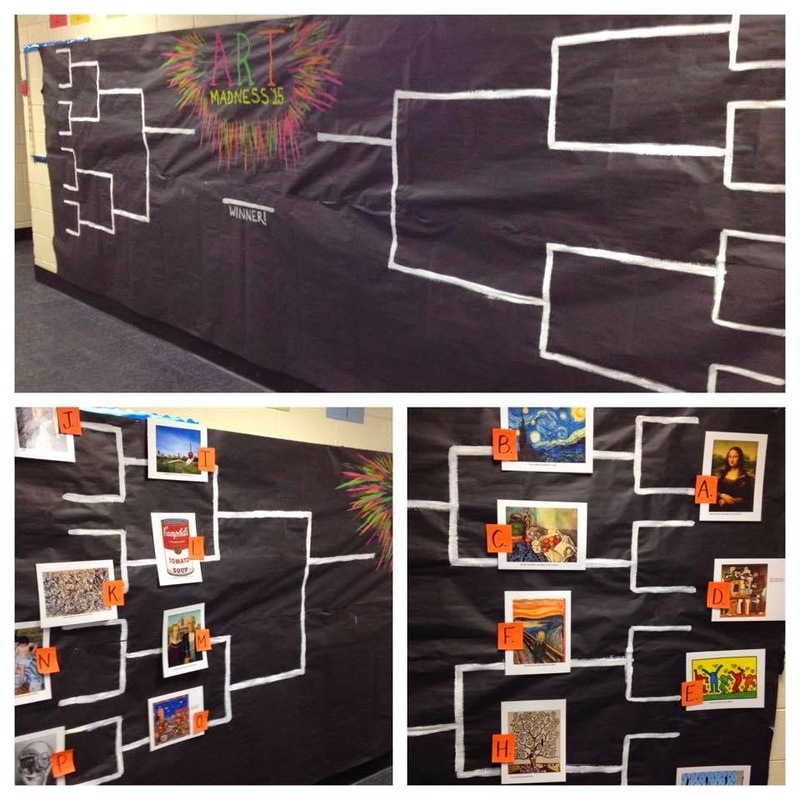 Your m"art"ch madness bracket is so awesome! I just had to try it. I have been putting it up over the past few days and the excitement is building before we've even started! Thank you so much for sharing all of your wonderful ideas, and allowing us to borrow! Hi - can you explain how your martch madness worked? did the kids vote? Thanks so much!